Image caption Fears were heightened by the case of three London schoolgirls who went to Syria. Schools are being offered new software that helps teachers spy on pupils' potentially extremist online activity. It alerts teachers if pupils use specific terrorism-related terms or phrases or visit extremist websites on school computers, laptops or tablets. Teachers are encouraged to look for a pattern of behaviour rather than raise the alarm after a single warning. Since February, the Counter Terrorism and Security Act has required schools to prevent pupils becoming radicalised. But the National Union of Teachers has expressed fears this could lead to debate on contentious issues being shut down. It also said some teachers feared they could be prosecuted if they dealt with a situation in the wrong way. 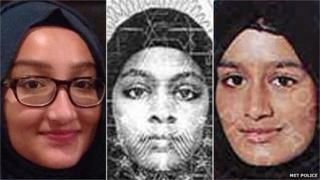 The issue was highlighted by the case of three London schoolgirls who travelled to Syria in February and are believed to be in the city of Raqqa, a stronghold of Islamic State. Their families later complained that police, the school and the local authority had failed to pass on information they said could have prevented the girls leaving. Jonathan Russell, political liaison officer at Quilliam Foundation, which developed the software, said: "The internet has made it easy for young people to access extreme or radical material. "While measures such as the UK government's Prevent Strategy already existed, it's now clear that more needs to be done to counter radicalisation early on. "Protecting young people from the dangers of radicalisation requires positive online counter-extremism, and empowering teachers with technology like Impero's keyword library is an important part of this process." Sally-Ann Griffiths, of Impero Software, which designed the program, said: "With a widely reported increase in the number of children being radicalised, it's vital that schools put measures in place to prevent pupils coming to harm online. "By defining terms such as 'yodo', a phrase used by jihadist sympathisers meaning 'you only die once', the glossary gives teachers, who are part of the solution to the problem, the tools they need to identify, intervene and safeguard at-risk pupils."